I have been trying to make Dahi Bhindi for so long and when I found this recipe here, I was so thrilled to try it out ASAP. This recipe is a keeper....everyone at home enjoyed it a lot..lets see if you like it too...give it a try ! Heat 2-3 tbsp of oil in a pan and fry okra pieces continuously on high flame till they are just cooked. It takes about 7-10mins.Make sure you retain the green color of okras. Transfer the cooked okras to a plate lined with paper towel to absorb excess oil. Heat oil in a pan, add mustard seeds, let it splutter. Then add cumin seeds , hing and curry leaves. Now add onions and fry till they turn golden. Now add ginger-garlic paste and fry till it is cooked [raw smell should disappear]. Add all the dry spices [kitchen king masala or garam masala, red chillie powder, coriander powder and amchur powder] along with Kasuri methi. I add water to the dry masala before adding to the curry. This protects the spices from getting burned. Add chopped tomatoes and sauté till they release their juice [maybe 2 minutes]. Add coconut-cashew paste and mix it nicely. Cook for a minute on medium heat. Now add salt and depending on the consistency of the gravy add 1/2 to 1 cup of water and cook for 5 minutes. Mix in fried okra [bhindi] and adjust for seasoning and consistency of gravy. Add more water if you think the gravy is thick. Simmer on low heat for 3-5 minutes. Yes, Suparna I loved the flavors of curry leaves, coconut, methi etc ...this is indeed a wonderful dish ! This dish looks really delicious Renu!Mouthwatering presentation! U have a wonderful space dear...! Looks lovely, perfect dish for Rotis. This looks so delicious! I have never had Dahi Bhindi before! Tempting! Fav dish for me ..looks so rich and yummy dear.. This is such a mouth watering picture dear! OMG!!! I'm soo tempted. Just loved this recipe, Renu..i am gonna bookmark this,thanx for sharing..
That looks great. How did you avoid the gravy from becoming sticky since both okra and yogurt naturally are.? 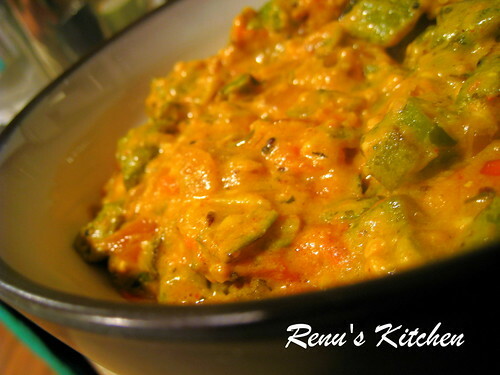 Oh wow looks soo rich and creamy, i love okra in curd based gravies, will try this next time! I made this last night and it was wonderful!! Thanks for the great recipe!